recommendations, marketing, education, tools, and hedging solutions. 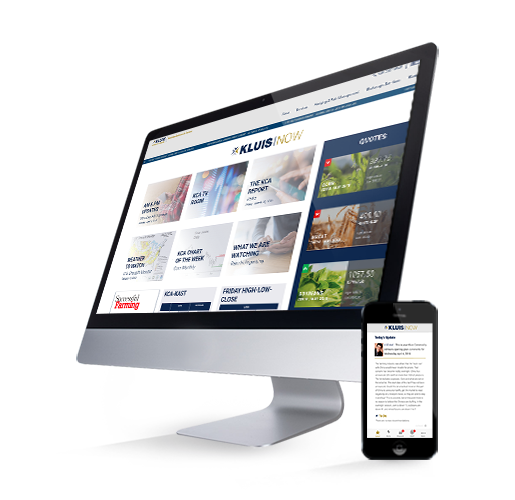 The Kluis Market Pack is for the farmer who wants to stay informed through marketing intelligence. From daily reports to actionable alerts and recommendations, the Kluis Market Pack encompasses total market insight from our grain marketing veterans that is accessible on any device. Access Kluis Market Pack on any mobile device! members-only content to move your markets. Sign up to receive details! to take their marketing to the highest level. plan, and how to successfully execute your plan.